Modelled with hand-knitted socks too! 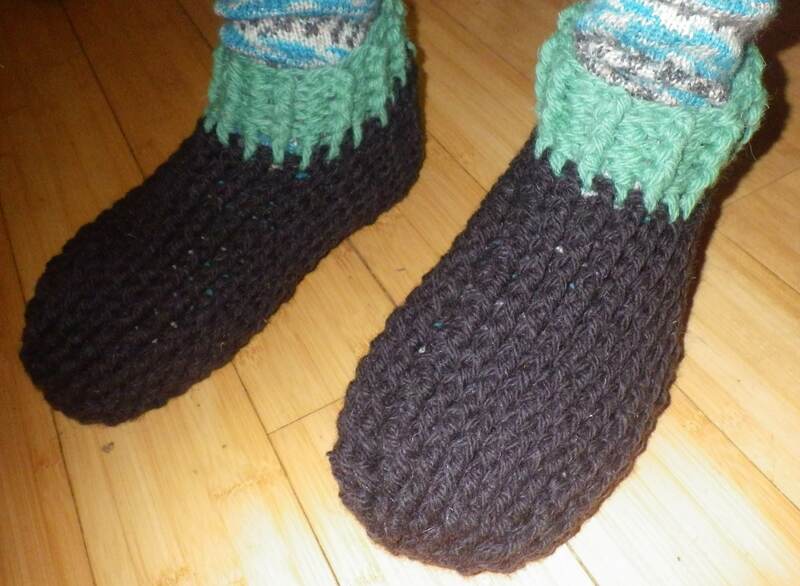 If you want to make some, the pattern can be found here: http://www.ravelry.com/patterns/library/adult-chunky-slippers … or you can pay me to make some for you! ITSA – it’s that snail again! He certainly seems pleased with them! They do look warm and comfy. Mmm… I need to make some for myself now! Do you have to put anything on the bottom – something grippy – so he is not skating on the polished floorboards? I haven’t treated the bottom, although I do have a tub of liquid latex for exactly this purpose, but Mr Soh thinks it’s not necessary – the only polished boards are in the kitchen, everywhere else is carpet. We’ll see how he get on! They are very attractive. Can you slide on the floor with them (intentionally, for fun)? I have visions of finding Mr Soh sliding up and down the kitchen on the bamboo floor… that may be why he turned down the offer of non-slip latex on the soles! Ah. That would be my choice, too! They really do…I was going to move on to other projects, but I think I might make myself a pair straight away! Quick to make too… oh and I just caught him sliding into the kitchen on them, so fun as well! Very cosy looking, and I particularly like the green cuff to make them look less, um, corporate! Will yours be identical, or with a different cuff so you can tell them apart? Pink would perhaps be too obvious, if very fetching! I’ve run out of the black yarn, but have some of the green, so mine will mostly in that… I want to have a go at making the toe to match the cuff with mine, just to see how it looks. Ooh no, I’ve changed my mind over a cup of coffee… combination of plain black chunky yarn and a strand of self-patterning sock yarn looks really good. The black wool is not as hard-wearing as the stuff I knitted Mr Snail’s slippers out of, but the strand of sock yarn should add strength… but better get on with some paid work now and earn a crust to feed my yarn habit!! They’re lovely! I want a pair!! Easy to make if you can crochet… and the pattern is free! 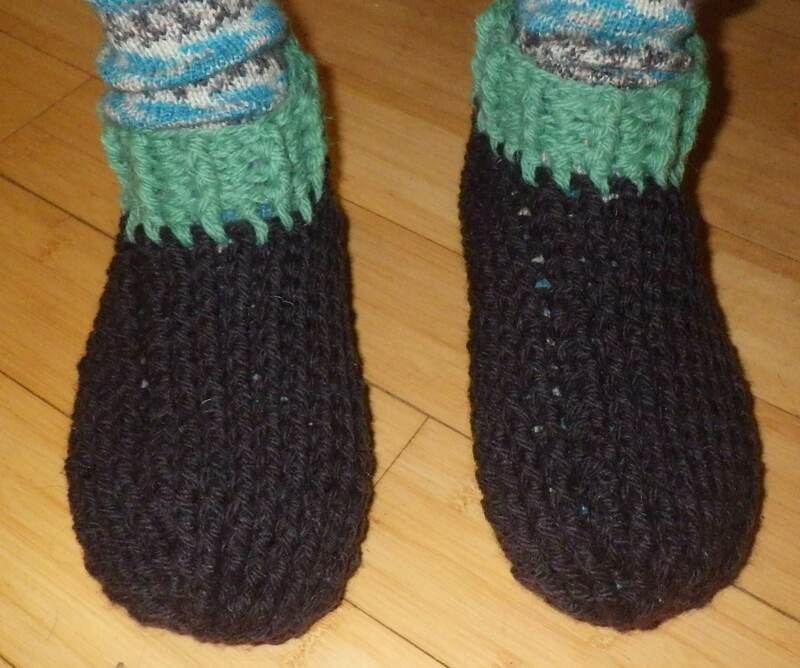 I have already succumbed to making a pair for myself!